I know a dish is good and spicy when it gives me the hiccups. The good thing about making dinner at home is you can control the level of spicy to suit your craving! Tonight, I was craving something with a kick and decided to "heat up" my pasta. Instead of using the spiralizer, I used a peeler to make zucchini noodles. I used the hand blender to mix the pasta sauce (you can get one of these for about $20), and used up the last of some parmesan I made the other day. Full of flavor, fresh pasta has always seemed like a tricky meal to make, but this raw dish is incredibly easy! And don't shy away from the spice... a little heat is good for ya! Using the hand blender, blend all ingredients until chunky. If it is too chunky, add more cherry tomatoes or a squeeze of orange juice. Peel 2 zucchini to make the noodles. Top with marinara and parmesan, and garnish with some oregano or basil. One thing I want to change is the general assumption that if you want to eat healthy, you have to miss out on great food. It's amazing to me that so many people assume I just eat cardboard all day. I want to show you that you can enjoy all the great flavors of foods you love and be healthy. My parents always talk about the "best key lime pie they have ever had" from a cruise they took 30 years ago. I guess I got my love for this tart pie from them! For tonight, I thought a cool gelato would be nice after this hot summer day. I still wanted that key lime pie taste, and after playing with some ingredients, I think I got it!. We froze it in separate cups and topped it off with some fresh mint from the garden. Now that I know I got the flavor down, I think I'll try to make a pie, too. Blend the ingredients using a Vitamix or a hand blender. Let it sit in the freezer for at least an hour. This soup is so simple, it has become one of my common go-to foods when I'm not sure what to eat. It is jam packed with vitamins, minerals, and nutrition! Soup is an excellent comfort food. It is great for rainy days, or when you're starting to feel sick. This soup is not only good for your soul, it will help you beat any cold or allergies you're figthing. Ideally, you would need a Vitamix to blend this into a smooth consistency. If you do not have one, a blender may work, but your soup will be chunkier. In the Vitamix, mix all ingredients above. Add the avocado after everything is blended. I usually top with sprouts, tomatoes, or chopped cucumber. 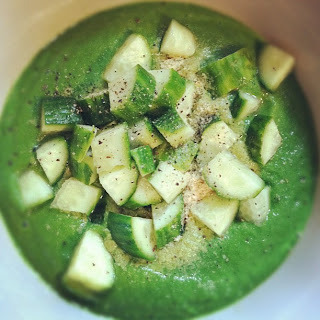 The soup above is topped with chopped cucumber, nutritional yeast, sea salt, and pepper. For breakfast today, I juiced apples, carrots, and lemon. It was sweet, satisfying, and better than coffee! I drank about 30 oz of this orange goodness. I've been on a Mexican food kick lately. Maybe it's because I have THREE cilantro plants in my back yard! Or maybe it's because I'm from Texas. Either way, Mexican food is great in the summertime. I put this recipe together with just a few minutes of chopping. It was great as a meal, but could also be a nice side dish. Chop the cauliflower in the food processor to make cauliflower rice. Place chopped cabbage in the bottom of a large bowl, add cauliflower, pepper, tomato, and corn. You can cut the corn right off the cob and eat it raw! In your vitamix, blend the mangoes and lime juice into a sauce. Pour on top of the rice bowl and garnish with cilantro, salt, and pepper. What it really looks like when you're eating it. My mom has an immersion blender at home which makes it really easy to make dressings, smoothies, and even soups! If you don't have a Vitamix, this is a much cheaper option that will help you make many of my recipes. They are also very easy to clean up! For lunch today, I made a big spinach salad with cilantro dressing. I got these orange cherry tomatoes at H-E-B because I love the color. I added chopped red onion, some dressing, and voilà! Using the immersion blender, blend all ingredients until smooth. Stir into salad. Enjoy! I flew home to Houston this weekend for a wedding. Although it was a quick trip, I am so glad I was able to go! I grew up with Elizabeth so it meant a lot to be there on her special day. She was so beautiful! This morning, I also visited Kristina and checked out Rawfully Organic - Houston's largest co-op! It was awesome. So much food and so many friendly faces. Kristina is not only an inspiration with her health, her passion and drive to work hard for what she loves is inspiring. Rawfully Organic's boxes come in a half share or full share - look at all this beautiful food! If you live in the Houston area, I highly recommend joining this co-op. Unfortunately, we do not have Jamba Juice in Nashville. This place is amazing. All the ingredients are fresh and real - it puts Smoothie King to shame. I got the Orange Carrot Karma which is fresh carrot & orange juice blended with mangoes and bananas. Yum! I also love H-E-B. This grocery store in insane! My mom and I go here when I come into town and she is kind enough to let me go crazy and buy a bunch of stuff. Their produce is fresh and they have a huge variety of fruits, veggies, and herbs - many of which are local. I found some cherimoya! I've been hearing about this fruit from friends in TX and Cali, but I've never been able to try it. It was creamy and tangy, unlike anything I've had before. H-E-B has a huge salad bar which makes grabbing a quick meal easy. I bought some fresh spinach, cilantro, tomatoes, papaya, strawberries, bananas, peppers, grapefruit, and asparagus. I am set for the weekend. Houston has so many good restaurants and healthy options. Hopefully next time I go, I'll have more time to do some restaurant reviews. When I started eating raw I ate a lot of sauerkraut. It is so bold and salty, it will definitely round out any meal. It is also great on salads as a dressing replacement. Sauerkraut is an excellent probiotic, which is important to aid in digestion and promote healthy bacteria in our intestines. Probiotics remove acidity in our system which, in turn, increase vitality and immunity. Basically, daily probiotics assist the colon tremendously. You'll see this positively affect your digestion, sinuses, and even acne! You can find raw sauerkraut at Whole Foods, or make your own following Kimberly Snyder's easy step-by-step guide. I highly recommend eating this as much as you can! Did you know that broccoli has more protein than steak? This is true. 100 calories of the green stuff (about 12 oz) contains 11.2 grams of protein. 100 calories of sirloin steak (about 0.84 oz) only has 5.4 grams of protein. Broccoli also has 182 mg Calcium...Steak has 2.4 mg. Broccoli has 2.2 mg Iron...Steak has 0.7 mg. Broccoli has 71.4 mg Magnesium...Steak has 5 mg. Broccoli has 643 mg Potassium... Steak has 88 mg. Broccoli is also MUCH higher in Folate, Vitamin B2, Vitamin C, and Vitamin A than steak. It is also rich in fiber, phytochemicals, and antioxidants while steak doesn't have any of this. It is a common American misconception that we need animal meat for protein. Eat your greens and you'll be full of protein, vitamins, and minerals! Lightly steam 1 large, chopped beet. Marinade overnight in chopped ginger & orange juice in a glass container in the refrigerator. This will stay fresh in the fridge for about 5 days.